City Creek Center - American Hydrotech, Inc. The story of City Creek begins in the early 2000s, when the Mormon church bought the aging malls across the street from the faith's world headquarters with plans to rejuvenate downtown. Leaders wanted something both world class and enduring. Water serves as a central feature. Reflecting pools, fountains, and a stream all sit atop a massive "green roof." Consultants recommended an integrated retail/office/residential design, with lots of open spaces for the public and unique features to create a shopping experience that could not be matched online. SWA Group was selected to convert these concepts into design drawings. 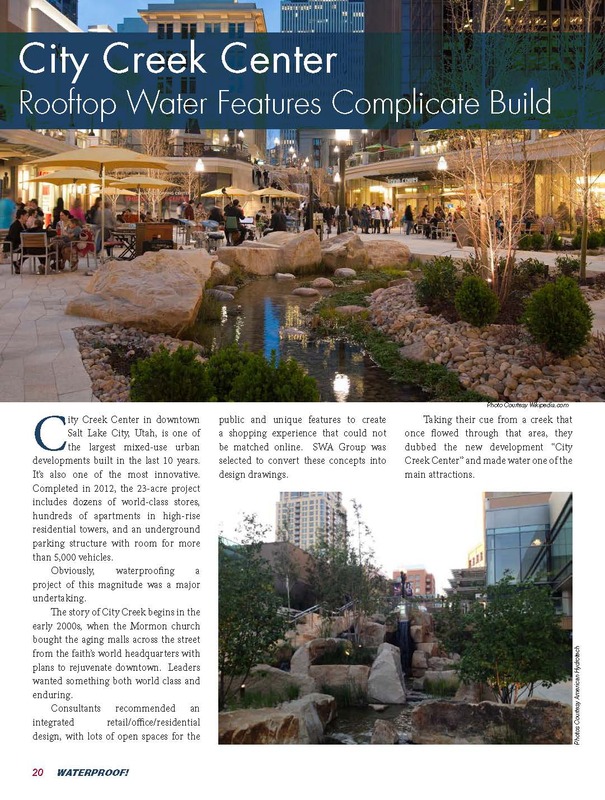 Taking their cue from a creek that once flowed through that area, they dubbed the new development "City Creek Center" and made water one of the main attractions. The central organizing feature is City Creek itself, which re-emerged after more than a century underground. The stream and promenade begin at the northeast corner and meander in an S-shape across the entire project. Along the way, the stream flows through a pond—stocked with live trout—and drops over two 18-foot waterfalls. This pedestrian-oriented green space runs the length of the development, about 1.2 kilometers, and drops more than 40 feet in the process. Over 300,000 square feet of Monolithic Membrane 6125 is used under the plaza, hardscape, planters and water features to create a one of a kind shopping experience.